The SureSeal drip-free propeller shaft seal is the model currently offered by Tides Marine. 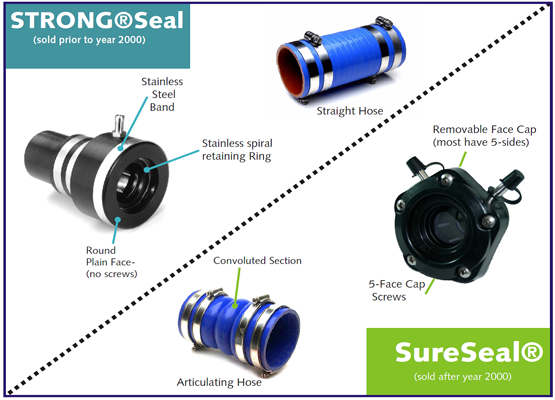 It replaced the StrongSeal in the year 2000. The StrongSeal has a stainless steel band around the front of the housing to maintain the Lip Seal dimensions. The Lip Seal is held in place by a Retaining Ring. The current SureSeal model has 5 or 6 Phillips-head screws (depending on propeller shaft size) in the face with a removable Cap and Split Washer. Some of the caps and collars are Pentagonal and some are Round. There is no difference between the Pentagonal and Round Caps other than their shape. The Lip Seal has a recess all around it to make removal of the Lip Seal easy using only a small flat bladed screwdriver.